Carmelo Greco is almost a Frankfuter, having been here for more than 20 years, first at the Osteria Enoteca (now closed) in Rödelheim where he teamed with the one-of-its-own Roland Brzezinski. Since 1996 he kept a Michelin star and finally emancipated himself and opened his own Ristorante together with some partners… The key takeaway is that this new Ristorante marks a real milestone in Carmelo’s development as his dishes are far more elaborate and refined than before, more and more drawing on classic Italian recipes with a lighted French backbone. A rather typical start at the Ristorante – to accompany a nice glass of spumante (from Franciacorta, of course), one can indulge in the first nibbles: an intense but not too dominant royale con Parmigiano, basically a parmesan flan, that is much lighter that expected and better dimensioned than before. The pairing with orange and espresso flavors contributes some acidity and sweetness. The Quail egg ‘bonbon’ is just perfect, a nice bite with slight support from the underlying cracker. Frequently, Carmelo integrates classic Italian dishes in his menu, here a rather classic version of the infamous ossobucco from Emilia-Romagna paired with a typical risotto Milanese with saffron. As good as it gets! A new dish, maybe only prepared for us that night is far more elaborate than Carmelo’s usual dishes. A fantastic carabiniero quality but the whole ‘construction turned out to be too protein-heavy that made it less pleasant to digest after all. But flavors were excellent! Back on the block is this wonderful land and sea combination (very characteristic to Carmelo) with slightly roasted scallops paired with incredibly tender porc belly from the endangered species Cinta Sinese, the Itailan version of Pata Negra pigs. They are restarting to cultivate the species in Massanera where they live semi-wild in the forest around Florance. The product is very rare but worth any penny because, compared to theie Spanisch cousins, these nice fellows are juicier and a bit more on the slightly sweet side. 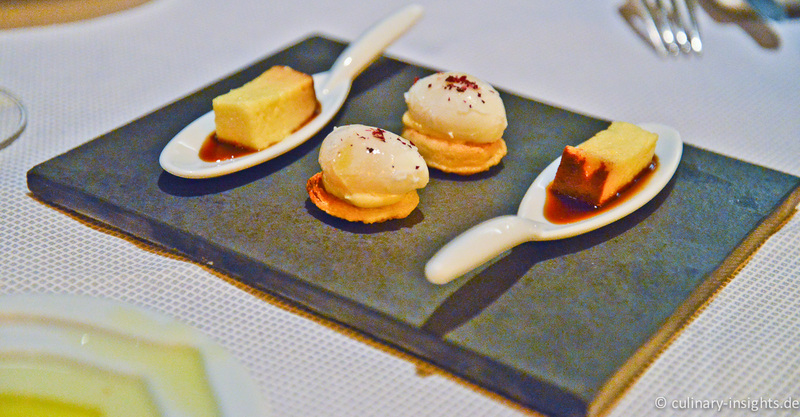 Perfect combination with the black truffles and the surprisingly light Fonduta cream – excellent! 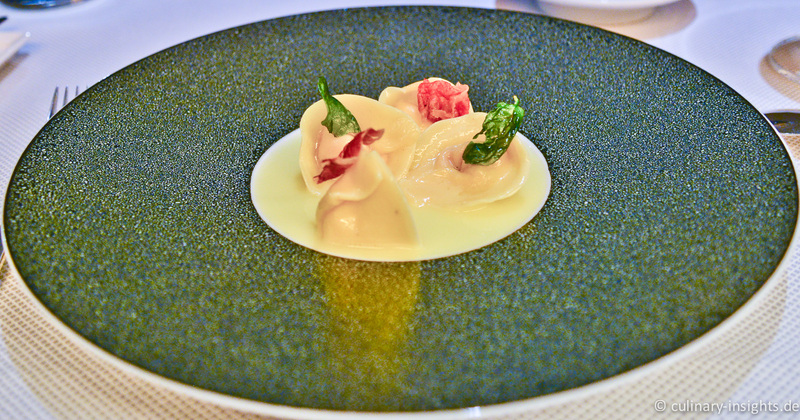 Another absolute signature – the tortelli filled with liquid Amitriciana and Carbornara sugo. A clever inversion as the sugo is inside and not outside so to demonstrate the essence of the taste in a more direct and clearer way. Divine. Carmelo’s fish courses always show some surprising sweet or acidic element – here the perfect skrei (Winter cod from Norway) gets the special touch by truffles and the port wine jus, and, genuine potatoes with a benchmark taste. In terms of menu dramaturgy it’s a step back in intensity at this point that is necessary not to overpower the aromas before coming to the main. Excellent dish! Nice take on the Nantaisian duck – incredibly tender breast cooked at perfection paired with a braised leg and accompanied with orange and tangerine that provided the extra kick. Especially the interplay of the slight sweetness of the duck itself (a bit caramelized on top), the shallots and the fruit filets made this outstanding – a declination of sweet facets backboned with acidity and herbal pea notes. A sweet finale with nougat ganache covered with white chocolate and a white chocolate ice cream on top. Excellent ending! This was a perfect evening – stunning food with only some minor improvement potential (the tuctuc), cozy atmosphere and perfect service celebrated by Peggy Braun (the Amador school in service shows – unpretentious, warm-hearty and family-like) who is unfortunately on maternity leave now. But I think she will be back soon. Sommelier Enrico Resta (now also acting as the mâitre d’) made us happy with a selection of nice Italian wines with the individual courses – it’s always worth to lay your fate into his hands. Overall it feels like a second living room – generosity shows in every detail and Carmelo’s cooking grows stronger and stronger. Just recently he is even more concentrating on the heritage of some iconic dishes from his mother land and cleverly demonstrates that they can be modernized without fancy gestures but relying on solid craftsmanship paired with some inventive thoughts. Carmelo’s Ristorante is a must in Frankfurt, prices are reasonable and the overall experience rocks! Thanks to the whole team for making me feel so comfortable in here! This entry was posted in Allgemein, Carmelo Greco, Europe, Germany - Fine Dining and tagged Carmelo Greco, Frankfurt, Germany, One Star Michelin, Sachsenhausen by IFS. Bookmark the permalink.